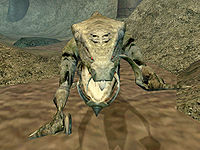 Description: A dog-like creature, more reptile than dog, is often kept by goblins for patrolling, and attacks on sight. Found: In the sewers of Mournhold accompanied by goblins. Disease: Some are known to spread the Rotbone disease. 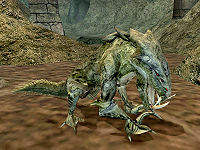 Description: The stronger specimen of these dog-reptile creatures are often raised by goblins and trained for battle. They are sturdier and even more vicious than the wild ones. Found: Next to goblin handlers in the underground of Mournhold. This page was last modified on 17 January 2014, at 20:22.